From today I am starting a new series titled “Living On The Edge” on climate change and its impacts on our society. 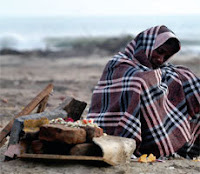 In this series you can find featured articles related to the plight of the deprived people in our society and how climate change is taking toll on their lives. Climate change is displacing thousands from their homes and habitats in South Asia. By 2100, they will be 125 million. As you drive west from Baroda — Gujarat’s cultural capital — towards the coast, it is hard not to marvel at the smooth, fourlane Vadodara-Bharuch National Highway Number 8, which gets you there. The only signs that suggest one is not on cruise control in an SUV somewhere on an expressway in America are occasional roadside dhabas with Indian names and poor passers-by, clad in saris or dhotis. Dwarfed by towering toll booths and expansive road tracks signalling human accomplishment, they seem to be walking slowly in the opposite direction – away from progress. Or perhaps it’s the illusion created as the cars zip past, leaving them behind in a haze of dust. Three hours on this road from Baroda and you arrive at Danti – a fishing village just 12 km away from where Mahatma Gandhi led his famous Dandi Salt March. The car meanders through a dirt path into the village. And then, the unmistakable signs of climate change — nature’s unforgiving backlash to human progress — start to show. Between the sea and a row of sea-flanked houses, which ends abruptly, there stands an 8-10 feet wall erected by the government. In the near distance, one can spot wells in the sea, brick-layered walls embedded deep in the sand; the flagpole of a temple. These are remnants of a village called Moti Danti, now mostly drowned in the Arabian Sea. Hundreds of fishing families from this village have permanently migrated inland. They are among the swelling ranks of global “environmental migrants” or “climate exiles” – people who have to leave their habitats because of sudden or gradual alterations related to one of three impacts of climate change: sea-level rise, extreme weather events, and drought and water scarcity. The quintessential non-combatants in the climate war, they are the ones who have contributed least to global warming, but whose lives and livelihoods are most threatened by it. Ganpat Bhai Tandel, who moved to Dandi with his family, is among them. Before moving, he says he rebuilt his house further inland five times. “I lost my boat, my income has reduced but at least there is satisfaction that the sea won’t enter our home here.” Still others have moved to the neighbouring areas of Billimora, Dungri, Kosamba and Lilapur. Further south along Gujarat’s 1,600 km coastline, in Kaladra village, sea-level rise has eroded an entire road stretch and forced hundreds of villagers to rebuild their homes further inland. The number of such climate migrants are not apocalyptic yet, but as a Greenpeace International Report from March 2008 warned, “If left unchecked, climate change could lead to global temperature increases of between 4-5°C, unleashing a barrage of impacts that will drive mass migration in India, Pakistan and Bangladesh.” In such a scenario, the number of environmental migrants could be as high as a catastrophic 125 million by the end of this century. But if global and local policy interventions contain global warming below the 2 degrees Celsius limit, the number of migrants would be 5 million. India has long argued that it cannot accept binding cuts on emissions because western nations are the biggest contributors and it cannot “compromise” its economic development and the aspirations of its poor people for a better standard of living. Yet, we are neither assisting nor protecting the millions of poor already vulnerable to climate change. The Government of India’s National Action Plan on Climate Change (NAPCC), released more than a year ago, made no mention of environmental migrants or a plan to help them adapt to climate change. Meanwhile, there are early but sure signs of the doomsday scenario unfolding across India. Vandana Shiva, noted environmentalist, attributes the Indian government’s “denial” to two things. “One, it feels that if it takes domestic responsibility it will weaken its international negotiating position. This is not true. Second, if it acknowledges the impact of a fossil fuel-based growth, it will have to give it up and there are too many powerful corporate interests linked to the nonsustainable trajectory”. In a recent opinion piece in the New York Times, two climate experts Sudhir Chella Rajan and Sujatha Bryvan, argued that the highest carbon-emitting nations, including China and India, should start accepting environmental migrants each year. In a post-9/11world, where immigration has tightened up all across Europe and in the US, the plan seems almost foolhardy. India itself is erecting barbed-wire fences along its porous border with Bangladesh – estimated to have 75 million climate migrants by the end of the century, the bulk of which will most likely migrate to India, say climate experts. Nor can India afford options such as sea walls and dykes, which countries such as Netherlands have put in place. “We don’t have the luxury of doing such things and nor is it a permanent solution,” says Rajan, who authored the Greenpeace report. The cost of protecting against a one-meter sea level rise, the reports estimates, would be $ 500,000 per km. It’s an untenable proposition for protecting India’s 5,700-7,500 km-long coastline. A few weeks ago, the environment minister, Jairam Ramesh, made a bold and unexpected attempt to move India’s climate policy into a more honest, sustainable, independent and responsible direction. It met with swift and predictable political opposition. But few are fooled by our hide-behind-the-poor hypocrisy anymore and millions are hurting. The West may have, and still continues to, contribute the most to global warming, but India and China have long since been playing catch-up. For our own greater good, the Indian contingent should do some serious soul-searching before it boards those high carbonemitting flights to Copenhagen.